Experience the thrills of every blockbuster action movie, every heart-pounding first-person shooter, and every explosive, high-octane escapade you can dream up. Inside this book, you’ll discover everything you need to build the ultimate modern-world campaign filled with cinematic adventure, and to create the dynamic heroes needed to face the harrowing dangers that await within. 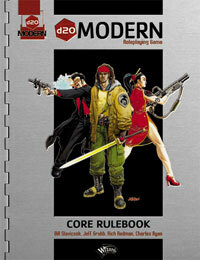 For players and Gamemasters, d20 Modern is compatible with the Dungeons & Dragons roleplaying game and other d20 System roleplaying games.